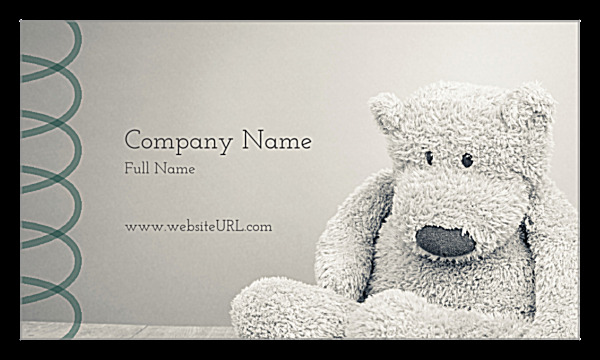 Command attention for your brand with our Bear Necessity business card design template, featuring a soft teddy bear image as a backdrop to your company, name, and web URL on the back and a two-toned, minimalist background on the front. 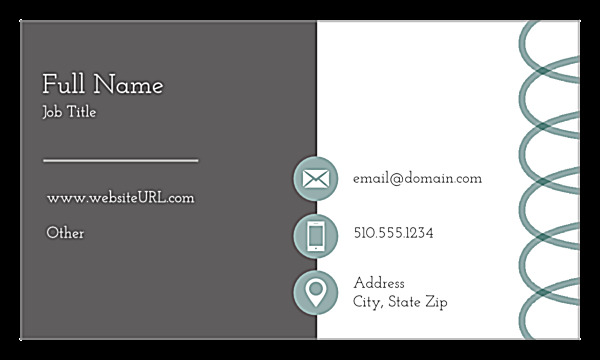 The front of this business card design template incorporates modern-looking flat icons to highlight your contact information. Add in unique spiral scrollwork, and you have a business card designed to impress at first-glance. Bear Necessity is perfect for gift retailers, photographers, babysitters, and home-based service providers. It’s available in four different color combinations and four edge trims, so you can complete your custom business card design to match your brand. Customize your design with ease using our online business card maker, which lets you use your mouse to click through layout options, upload your logo, and change your fonts. Add a tagline and input your own company name, name, title, and contact information for a design that’s unique to your brand. Download a free PDF to share your finished design, then choose your printing options. That’s all you need to do to print professional-looking business cards, no designer required! If you want affordable pricing and great value for custom business card printing, you’ve come to the right place. PsPrint’s state-of-the-art printing presses vividly replicate your design on some of the finest business card paper stocks available. Need assurance you’ve found the best online business card printer? Check out our customer satisfaction guarantee.